Ankle and foot anatomy - want to learn more about it? If you’ve watched a documentary film about primates likes chimps or orangutans you may have thought how useful it would be if we could use our feet the same way we use our hands. Then we could underline our anatomy textbook with our hands, and make flashcards with our feet at the same time. But, evolution has refined our feet to be compatible with walking bipedally. This is why the anatomy of the foot might roughly resemble the anatomy of the hand but is still different enough to have different functions. Thus, this page is dedicated to the anatomy of the ankle and foot. The ankle joint, also known as the talocrural joint, allows dorsiflexion and plantar flexion of the foot. It is made up of three joints: upper ankle joint (tibiotarsal), talocalcaneonavicular, and subtalar joints. The last two together are called the lower ankle joint. Ankle joint - an overview. The upper ankle joint is formed by the inferior surfaces of tibia and fibula, and the superior surface of talus. The lower ankle joint is formed by the talus, calcaneus, and navicular bone. The joint is supported by a set of ankle ligaments: the medial collateral or deltoid ligament, and lateral collateral ligament. We’ve got you covered with everything you need to know about the ankle joint and its ligaments with these articles, video tutorials, and quizzes. Bones and ligaments of the foot diagram. Tarsals make up a strong weight bearing platform. They are homologous to the carpals in the wrist and are divided into three groups: proximal, intermediate, and distal. The proximal tarsal bones are the talus and calcaneus. The intermediate tarsal bone is the navicular. The distal tarsals are the cuboid and three cuneiform bones (lateral, intermediate, and medial). The easiest way to learn all about the tarsal bones is to review them one by one. You can do that with our articles, videos, and quizzes. Metatarsals are homologous to the metacarpals of the hand. They are involved in supporting body weight. Phalanges also parallel the hand, the lateral four toes are made up of three phalanges (proximal, middle, and distal). Whilst the great toe (hallux) is comprised of only two phalanges (proximal and distal). We encourage you to take a look at our video tutorial and quiz to find out more about the bones of the foot and foot ligaments. Besides the ankle joint which connects the foot with the leg, the bones of the foot articulate among themselves through many synovial joints. There are four groups of foot joints: intertarsal, tarsometatarsal, metatarsophalangeal, and interphalangeal. The intertarsal joints are between the tarsal bones. These joints are the subtalar (talocalcaneal), talocalcaneonavicular, calcaneocuboid, cuneonavicular, cuboideonavicular, and intercuneiform joints. Tarsometatarsal joints are the articulations between the tarsals and metatarsals. Metatarsophalangeal joints (MTP) are the joints between the heads of metatarsals and corresponding bases of the proximal phalanges of the foot. Interphalangeal joints are between the phalanges of the foot. The great toe has only one interphalangeal joint, while the other four toes have a proximal (PIP) and a distal (DIP) interphalangeal joint. Want to review joints and ligaments of the foot in more detail? Sure, we recommend you this article. Foot muscles contribute to eversion and inversion of foot, movements of the toes, as well as plantar flexion and dorsiflexion. We encourage you to watch this video tutorial and then quiz yourself to learn all about the foot muscles. The foot muscles are divided into plantar and dorsal groups. There are only two muscles in the dorsal group, while the plantar muscles are further subdivided into three groups; lateral, central, and medial. 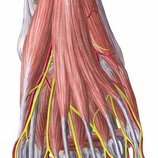 Muscles of the foot - an overview. The dorsal foot muscles are in the dorsum of foot and they extend the toes. They are the extensor digitorum brevis and extensor hallucis brevis muscles. You want to know everything about the dorsal foot muscles? Sure, we’ve got some articles and videos ready for you. The plantar foot muscles are divided into three groups of muscles by the deep fasciae of the foot: lateral, central, and medial. Note that plantar muscles can also be studied as four layers, but here they are presented as groups. The lateral plantar muscles act upon the fifth toe. They are the abductor digiti minimi, flexor digiti minimi brevis, and opponens digiti minimi muscles. Learn more about the lateral plantar muscles with these article and video tutorials. Central plantar muscles act upon the lateral four toes. They are the flexor digitorum brevis, quadratus plantae, four lumbricals, three plantar interossei, and four dorsal interossei muscles. It may seem that there are a lot of the central plantar muscles. But don’t worry, check out our article and video tutorials. You’ll catch up with everything you need to know about them. Medial plantar muscles act upon the great toe, or hallux. They are the abductor hallucis, adductor hallucis, and flexor hallucis brevis muscles. Note that tendons in the foot are protected with tendon sheaths. We can help you with both tendons sheaths and with medial plantar muscles. Check out these articles and video tutorials to learn about them in a fun and engaging way. To master all lower limb muscles, check out this ebook with high-quality illustrations. It provides a quick reference to lower limb muscle origins, insertions, innervations and functions. This custom quiz tests your knowledge about the ankle and foot. It specifically focuses on bones, ligaments, and muscles (including attachments, innervation, functions). Have a go to conquer the anatomy of the ankle and foot!